Other Names: La Glorieta Pass Location: Santa Fe County and San Miguel County Campaign: Sibley’s New Mexico Campaign (1862) Date(s): March 26-28, 1862 Principal Commanders: Maj. Description: Glorieta Pass was a strategic location, situated at the southern tip of the Sangre de Cristo Mountains, southeast of Santa Fe, and on the Santa Fe Trail. In March 1862, a Confederate force of 200-300 Texans under the command of Maj. Charles L. Pyron encamped at Johnson’s Ranch, at one end of the pass. 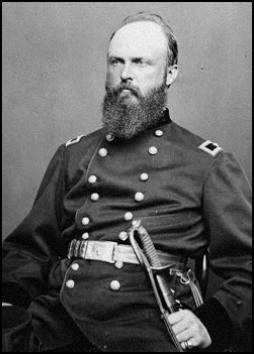 Union Maj. John M. Chivington led more than 400 soldiers to the Pass and on the morning of March 26 moved out to attack. After noon, Chivington’s men captured some Rebel advance troops and then found the main force behind them. Chivington advanced on them, but their artillery fire threw him back. He regrouped, split his force to the two sides of the pass, caught the Rebels in a crossfire, and soon forced them to retire. Pyron and his men retired about a mile and a half to a narrow section of the pass and formed a defensive line before Chivington’s men appeared. The Yankees flanked Pyron’s men again and punished them with enfilade fire. The Confederates fled again and the Union cavalry charged, capturing the rearguard. Chivington then retired and went into camp at Kozlowski’s Ranch. No fighting occurred the next day as reinforcements arrived for both sides. 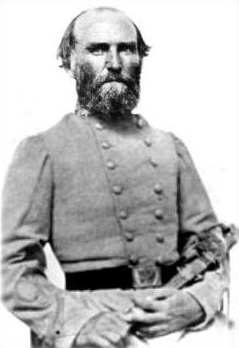 Lt. Col. William R. Scurry’s troops swelled the Rebel ranks to about 1,100 while Union Col. John P. Slough arrived with about 900 men. Both Slough and Scurry decided to attack and set out early on the 28th to do so. As Scurry advanced down the canyon, he saw the Union forces approaching, so he established a battle line, including his dismounted cavalry. Slough hit them before 11:00 am. The Confederates held their ground and then attacked and counterattacked throughout the afternoon. The fighting then ended as Slough retired first to Pigeon’s Ranch and then to Kozlowski’s Ranch. Scurry soon left the field also, thinking he had won the battle. Chivington’s men, how-ever, had destroyed all Scurry’s supplies and animals at Johnson’s Ranch, forcing him to retreat to Santa Fe, the first step on the long road back to San Antonio, Texas. The Federals had won and, thereby, stopped Confederate incursions into the Southwest. Glorieta Pass was the turning point of the war in the New Mexico Territory. 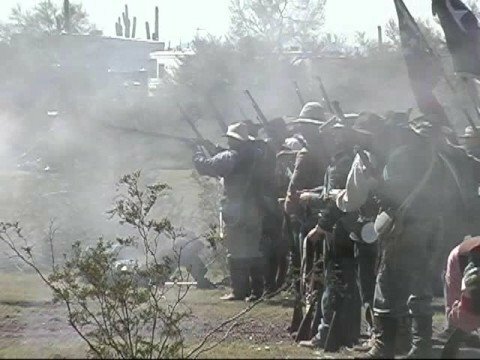 The Battle of Glorieta Pass, fought from March 26 – 28, 1862 in northern New Mexico Territory, was the decisive battle of the New Mexico Campaign during the American Civil War. Dubbed the "Gettysburg of the West" by some historians, it was intended as the killer blow by Union forces to halt the the Confederate invasion of the West along the base of the Rocky Mountains. 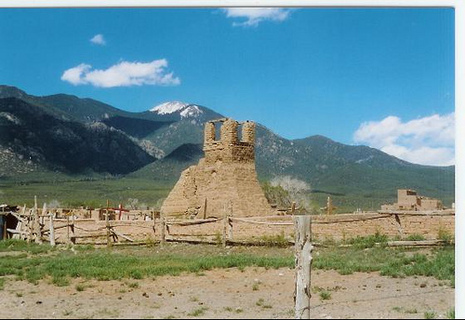 It was fought at Glorieta Pass in the Sangre de Cristo Mountains in what is now New Mexico, and was an important event in the history of the New Mexico Territory in the American Civil War. There was a skirmish on March 26 between advance forces from each army, with the main battle occurring on March 28. Although the Confederates were able to push the Union force back through the pass, they had to retreat when their supply train was destroyed and most of their horses and mules killed or driven off. Eventually, the Confederates had to withdraw entirely from the territory back into Texas. Glorieta Pass thus represented the "high water mark" of the campaign. The Texans were led by Charles L. Pyron and William Read Scurry. During the battle on March 26, Pyron had his battalion of the 2nd Texas Mounted Rifles, four companies of the 5th Texas Mounted Rifles under Maj. John Shropshire, and two cannons. Scurry's force included nine companies of the 4th Texas Mounted Rifles under Maj. Henry Raguet, five companies of the 7th Texas Mounted Rifles under Maj. Powhatan Jordan, and three additional cannons. Pyron's force of 300 camped at Apache Canyon, at one end of Glorieta Pass, leaving a picket post of fifty men at the summit of the pass. 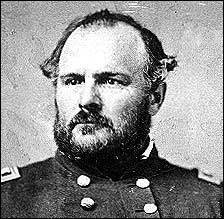 Chivington led 418 soldiers to the Pass and on the morning of March 26 moved out to attack. After noon, Chivington’s men captured the picket post and then found the main force behind them. Chivington advanced on them, but their artillery fire threw him back. He regrouped, split his force to the two sides of the pass, caught the Confederates in a crossfire, and soon forced them to retire. Pyron retired about a mile and a half (not quite two and a half kilometers) to a narrow section of the pass and formed a defensive line before Chivington’s men appeared. The Union forces flanked Pyron’s men again and punished them with enfilade fire. Pyron ordered another retreat, but the withdraw of the artillery caused the Confederates to become disorganized and start fighting in separate clusters of men. Chivington ordered a mounted Colorado company to make a frontal charge against the artillery; this charge succeeded in capturing several Confederates and scattering the rest. Not knowing if Confederate reinforcements were nearby, Chivington then retired and went into camp at Kozlowski’s Ranch to await Slough with the main body. His small victory was a morale booster for Slough's army. No fighting occurred the next day as reinforcements arrived for both sides. Scurry's troops arrived at 3 A.M. on March 27, swelling the Confederate force to about 1,100 men and five cannons; as senior officer present, Scurry took command of the entire Confederate force. Thinking that Slough would attack again and expecting Green to arrive in the Union rear at any time, Scurry choose to remain in place for the day, digging rifle pits. Slough arrived early in the morning of March 28 with about 900 more men, bringing the Union strength to 1,300. Both Scurry and Slough decided to attack on March 28 and set out early to do so. Expecting the Confederates to remain in Apache Canyon, Slough sent Maj. Chivington with the same 400-strong force that he had led at Apache Canyon out in a circling movement with orders to go hide out at Glorieta Pass and hit the Texans in the flank once Slough's main force had engaged their front. Chivington did as ordered and his men waited above the Pass for Slough and the enemy to arrive. But instead of remaining at Apache Canyon as Slough had expected, Scurry advanced down the Canyon more rapidly than Slough had anticipated. Scurry expected the Union force was retreating back to Fort Union; he intended to attack them until Green arrived. One cannon and a small detail was left at Johnson's Ranch, the rest of the Confederate force, with more than a thousand men, marched eastwards along the Sante Fe trail. When Slough found the Texans so far forward, he launched an attack, hitting the Texans around 11:00 a.m. about a half mile from Pigeon's Ranch. A provisional battalion of four companies from the 1st Colorado under Lt. Col. Samuel Tappan, supported by both batteries, deployed across the trail. The Confederates dismounted and deployed in a line across the canyon but the terrain caused some companies to become intermingled. Tappan was initially successful in holding his ground for a half hour, but the Confederates' numerical superiority enabled them to outflank the Union line by noon. Slough reformed his men a few hundred yards closer to Pigeon's Ranch, with four companies under Tappan and an artillery battery on a hill to the left, the other battery supported by two companies in the center across the road, and the other two companies on the ridge to the right. 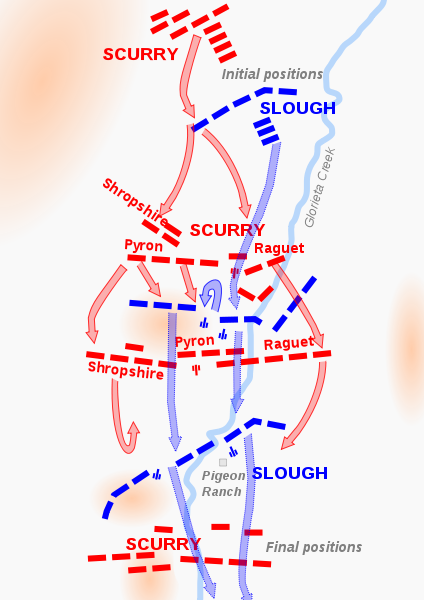 Scurry then launched a three pronged attack on the Union line: Pyron and Raguet were ordered to attack the Union right, Shropshire the Union left, with the remainder of the Confederate force under himself attacking the Union center, supported by the artillery. The attack on the Union left was routed, with Shropshire killed, the attack in the center stalled, while the artillery was forced to withdraw after one cannon was disabled and a limber destroyed. The attack along the line then stalled, with the Confederates fighting by squads "with a desperation unequaled by any engagement of the war." At around 3:00 P.M., the Confederates managed to outflank the Union right, but Raguet was mortally wounded. From the ridge (known after the battle as "Sharpshooters Ridge"), the Confederates started to pick off the artillerymen and infantry below them, while Scurry started to press the Union center again. This made the Union position untenable, forcing Slough to order a retreat; Tappan organized the companies on the left flank into a rear guard. Slough then reformed his line a half mile east of Pigeon's Ranch, where both sides skirmished until dusk. Slough retreated back to Kozlowski's Ranch, leaving Scurry in possession of the field. Many New Mexicans disputed the view that Chivington was the hero of Johnson's Ranch. Some Santa Feans credited a Bureau of Indian Affairs official, James L. Collins, with suggesting the roundabout attack on the supply train. The truth is that Chivington had been sent out in the hope of making a flank attack, and the discovery of the supply train was a lucky accident. But Chivington was accused of almost letting the opportunity slip. The New Mexico Territorial Legislature adopted a resolution on January 23, 1864, that did not mention Chivington but asked President Lincoln to promote William H. Lewis and Asa B. Carey, both Regular Army officers, for "distinguished service" in the battle. On March 8, the Rio Abajo Press of Albuquerque editorialized against "Col. Chivington's strutting about in plumage stolen from Captain William H. Lewis". (It did not mention Carey.) The editorial claimed that "Some one of the party" suggested the attack, that Chivington agreed after "two hours persuasion", and that Lewis led the attack while Chivington was "viewing the scene from afar". A rather more serious allegation made against Chivington was that if he had hurried to reinforce Slough as soon as he heard the gunfire coming from Pigeon's Ranch, his 400 men might have swung the battle in favor of the Federals – especially if he had led them against Scurry's flank, as ordered. In the end, the Battle of Glorieta Pass proved remarkably important. First, despite the fact that the Confederates took the field, due to the destruction of their supplies they were forced to retreat back to Santa Fe, and eventually abandon New Mexico Territory. Second, the battle at Glorieta foiled Sibley's plan to obtain his key objective: the capture of the major Federal base at Fort Union. The fall of Fort Union would have broken Federal resistance in New Mexico, and compelled Union forces to retire north of Raton Pass and back into Colorado Territory. In the end, the dreams of a Confederate stronghold in the Southwest were impractical: New Mexico did not provide enough food or sustenance for any prolonged Confederate occupation. Furthermore, the approach of the Federal "California Column" eastward through the New Mexico Territory during the summer of 1862 would have seriously jeopardized any Confederate claims to the region. In 1993, the Congressionally appointed Civil War Sites Advisory Commission issued its "Report on the Nation’s Civil War Battlefields." The Commission was tasked with identifying the nation’s historically significant Civil War sites, determining their importance, and providing recommendations for their preservation to Congress. Of the roughly 10,500 actions of the U.S. Civil War, 384 (3.7%) were identified by the Commission as principal battles and rated according to their significance and threat of loss. 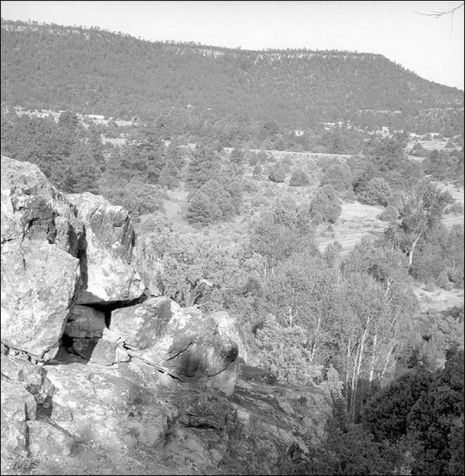 The Battle of Glorieta Pass received the highest rating from the Commission, Priority I (Class A). Class A battlefields are principal strategic operations having a direct impact on the course of the war. With this rating the Commission placed Glorieta Pass on the same level with battles such as Gettysburg and Antietam. The Priority I rating identified Glorieta Pass as being not only one of the most important, but also one of the most highly endangered battlefields in the country. Only 10 other battlefields received the Priority I (Class A) rating. The Commission recommended that Congress focus its preservation efforts on Priority I, nationally significant battlefields. Since 1993 portions of the Glorieta Pass Battlefield have become a unit of the National Park Service. The Glorieta Pass unit (Pigeon’s Ranch) comprises roughly 20% of the total battlefield. The remaining 80% is in private ownership. Glorieta Pass Battlefield is managed by Pecos National Historical Park and supported by the Glorieta Battlefield Coalition, a non-profit citizens' organization. The Glorieta Pass Battlefield is also designated as a National Historic Landmark – a site possessing exceptional value or quality in illustrating or interpreting the heritage of the United States. Fewer than 2,500 historic places in the nation bear this distinction. The battle is described in the historical novel Glorieta Pass by P. G. Nagle. The 1966 Sergio Leone film The Good, the Bad and the Ugly refers obliquely to the battle, setting one scene at Johnson's Ranch where the Confederates appear to be guarding their supply wagons around the time of the battle.